Can you imagine driving down the street and coming upon crazy scene like the one below? 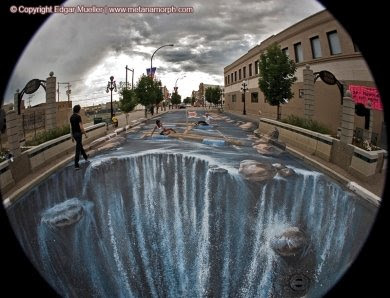 Found on Geekologie: really kewl street art by artist Edgar Müller. According to his bio, "Around the age of 25, Müller decided to devote himself completely to street painting. He travelled all over Europe, making a living with his transitory art." I admire people who can turn their passion into their career. Check out his site for more incredible images. Breath-taking.